Wolter Power Systems, a division of Wolter Group LLC, has donated two generators to Gateway Technical College for students to train on and help diversify their skills and better succeed in their career. The equipment includes an industrial Generac diesel generator, fully functioning and equipped with enclosure and self-contained fuel tank, and an 18KW commercial generator. The cutting-edge power systems used in industry today will provide a great opportunity for students to become skilled and proficient as technicians of the equipment. Students in Gateway’s Motorcycle, Marine and Outdoor Power Products as well as the Diesel Equipment Technology programs will train on the generators. They will gain skills in working with equipment from an industry leader, says Joe Fullington, dean, Gateway School of Business and Transportation. Wolter Power Systems is also providing technicians and trainers to assist with classroom activities and learning workshops, along with product and theory training materials to be used in the classroom. “Wolter Power Systems believes in educating the workforce of tomorrow and helping to bridge the skills gap through providing industry insight and resources to colleges today,” says Dan Peters, general manager of Wolter Power Systems. 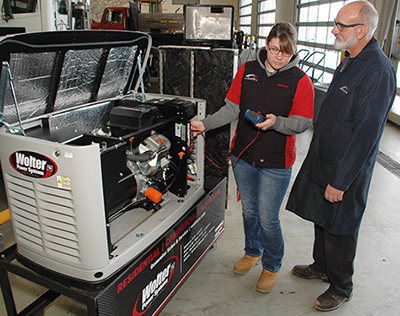 Image: Gateway student Rae Schielie trains on a generator with Diesel Technology instructor Joe Palacek. Wolter Power Systems donated two generators to the college on which students will train.